Today, a fireplace can be added to almost any room of the house where you want warmth, comfort and ambience. Wood, gas or electric fueled fireplaces are versatile in size and structure and can make a design statement. Here are several fireplace design ideas from our portfolio of remodeling projects for homeowners in the Greater Cincinnati area. A two-sided fireplace both separates and serves a dining area and living room space in this open floor plan. A simple mantel and tile heart adorn the stone façade in the dining area. Many homeowners are opening up spaces that were once separated by walls (dining room, living room and kitchen) to create an open concept multipurpose area for everyday use and entertaining. 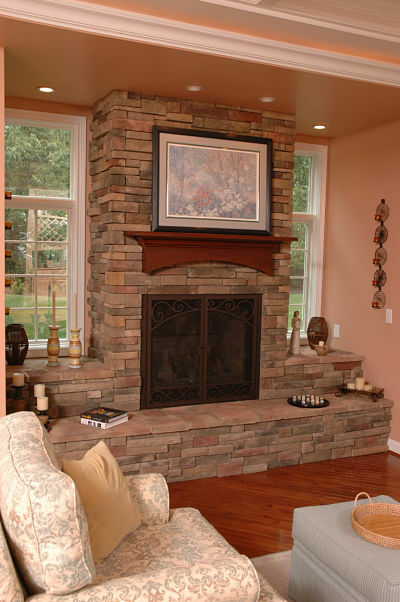 Often a fireplace is added as a focal point in the space and can provide efficient supplemental heating. The living room area of this open concept space is warmed by a gas fueled two-sided fireplace with a simple cherry finish mantel. For generations, living rooms have been the primary location of fireplaces. A fireplace is a decorative element that complements a home’s architecture and style - formal or casual. 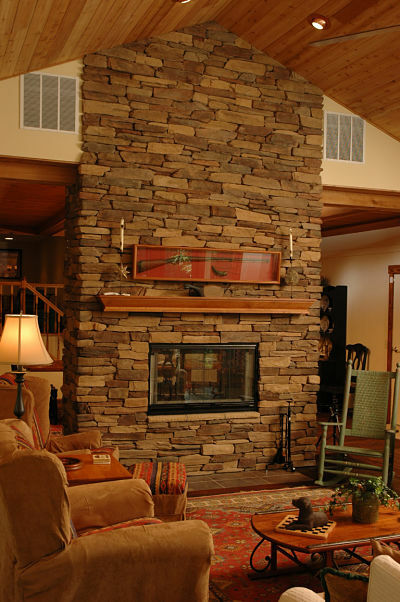 A gas fireplace with a stone façade provides fireside seating and shelves for display in this living room. Dining rooms are gathering places and ideal for holiday entertaining. A fireplace can help to set the mood for special occasions. The combination of rustic elements of a mortared limestone façade fireplace, the elegant formal elements of a large crystal chandelier and the intricate design of the fireplace screen reflect Country French décor in this formal dining room. Home is where “the hearth” is. A play on words but appropriate for the way we use a family room in our homes. These are casual gathering places where we can relax at the end of a day and gather to watch TV, play games, read or just chat. A fireplace helps to make a house a home. A brick façade fireplace with a mantle that matches custom cabinetry provides a focal point in this family room. In today’s fast-paced world more people are creating a retreat at home. Master baths are private spaces to relax and escape from stresses of the day. 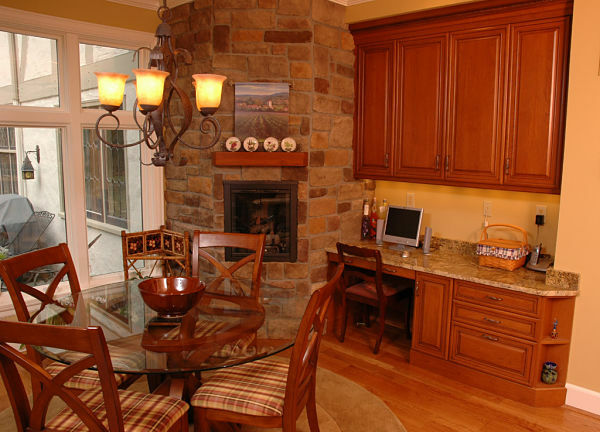 One of the amenities to consider is a fireplace. Gas fireplaces come in a variety of shapes, sizes and styles that can fit into a corner as well as a front wall. 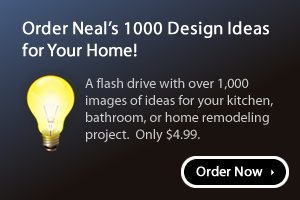 There are sizes ideal for a bathroom. A small two-sided arched fireplace warms both a master bathroom and bedroom. 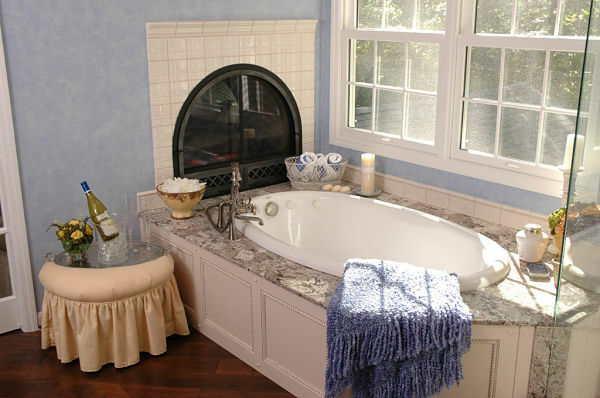 In the bath, a tile surround was used and a platform built to connect the fireplace to a soaking tub. A fireplace in a master bedroom can provide supplemental heat on a cold winter night or create a romantic mood. This two-sided gas fueled fireplace features a wood mantel and elevated hearth capped with stone in a traditional-style master bedroom. There was a time when fireplaces were used for cooking. Cast iron pots were filled with soups and stews and cooked over the fire of a wood-burning hearth. Today, a fireplace can add an interesting architectural element to a kitchen reminiscent of the past or complement contemporary décor. A corner fireplace with a stone façade fits well into the design of this traditional-style kitchen. With the tall windows and glass doors in the room, the fireplace supplements heat during cold days. If you are planning to convert a basement into expanded living space you may want to consider the advantages of a gas fireplace unit. A fireplace can help to lower the humidity that typically occurs in basements. Gas fireplaces are easy to operate and the flame can be adjusted with a remote control unit. Plus, gas burns cleanly. 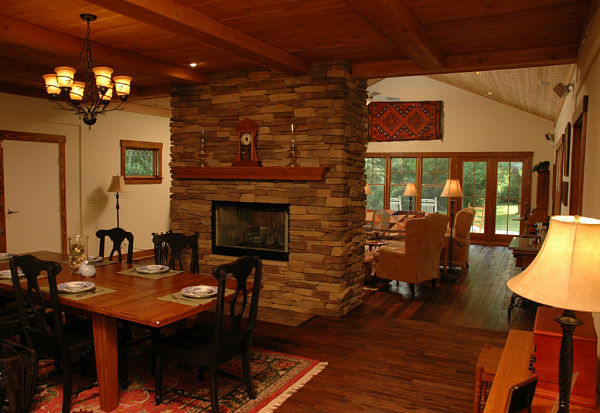 A fireplace will also add light, ambience and warmth to a lower level living space. Since lower levels often have irregular nooks and crannies, fireplaces can be figured into the design to determine where it should optimally be placed. A gas fireplace was installed in a corner of the media area of this multipurpose lower level living space. 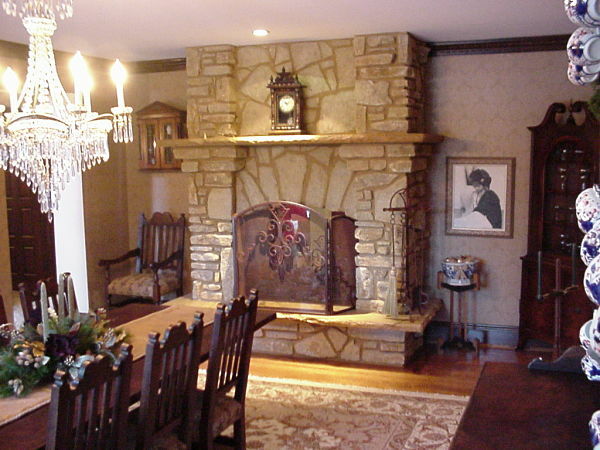 An extended cap on the base of the fireplace and a wall bench were added for seating a crowd around the hearth. In more homes there are now rooms designed specifically to accommodate media equipment. 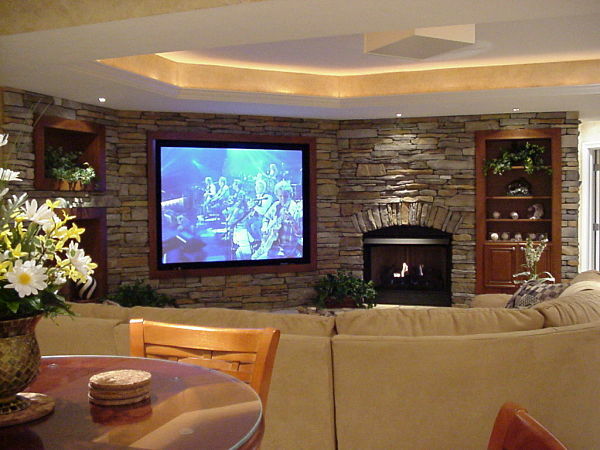 Flat screen and projection televisions are the perfect companion for a fireplace. Television screens are being installed either over a fireplace that is often in the center of a room or adjacent to a fireplace. Speakers are added to ceilings and walls to create a surround-sound experience. 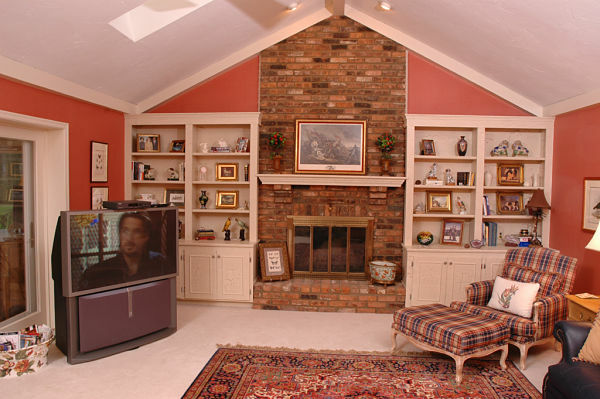 Cabinetry helps to hide wires and provide storage for cable boxes, DVD players and movies. 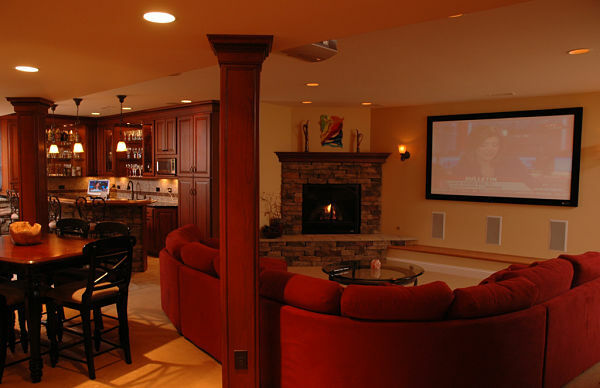 A projection screen television and fireplace are integrated into a wall of veneered stone in this media room. Built-in cabinets provide storage for components and accessories. A tray ceiling is equipped with lights that operate on a dimmer switch that can be adjusted for optimal viewing. 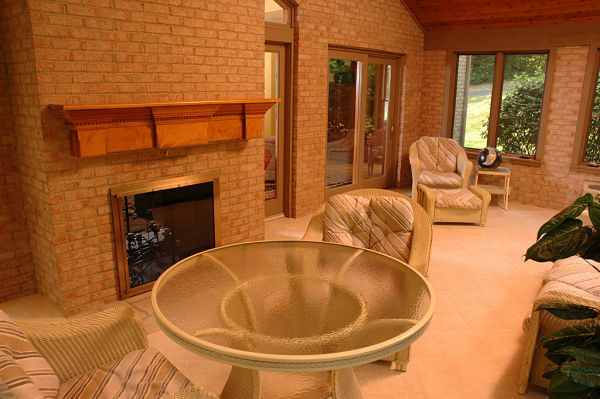 A fireplace can provide a source of heat to a sunroom or three-season room addition that may operate on a separate heating system. In the summer, candles are placed in the fireplace to add charm to this three-season room. On colder days, the fireplace is operational and extends the number of days the space can be used.